We are back in our studio again after yet another successful and whirlwind of a show! Making this our third year in attendance, Toronto’s Interior Design Show is really one of our favourites! As a participant of Studio North – a section of IDS showcasing custom products and limited edition collections – we are always thrilled to see familiar faces and meet new makers. It takes courage to stand before the work you have laboured over endlessly – it is a test for yourself, your work, and the audience it engages. The spirit of comradery is very much alive at Studio North, and might we say, it feels as if we “clicked our heels” because it is an environment that welcomes you with open arms! The impressive maquette's of Djuna Day Studio. Over the three and a half days we had the chance to catch up with exhibitor and friend Djuna Day of Djuna Day Studio. With a vigorous commitment to craft, Djuna designs furniture balancing modern aesthetics with boldness and grace. This year’s booth was brilliant as always, creating to-scale maquettes of past and present work, as well as including full size finished pieces. The immaculate forms of Brothers Dressler on display at the IDS 2017 Ontario Wood Exhibit. The Ontario Wood exhibit showcases work by Ontario makers from locally sourced wood products, with the entire sculptural backdrop being dismantled and re-used by Habitat for Humanity upon completion of the show. We couldn’t help ourselves but share with you the immaculate fixtures of Brothers Dressler. Their remarkable work is always a source of inspiration in both design and craftsmanship. Maker – a category of IDS that is curated by Design Milk, showcases businesses of small to medium scale manufacturing capabilities that are able to remain intimately involved in the creative process. Perhaps you’ll find us there next year?! Luxi leaves IDS each year feeling energized and elated! We thank all of our fellow exhibitors, designers, and dare we say fans who visited our 5’x10’ cube of light, labour, and love. We are back in the studio and ready to get back to designing – until next time! IDS 2017 is less than a week away! How the time does fly when you're having fun - and it seems the fun will continue as we kick off the show with a gala the evening of January 19th, where guests are encouraged to put on their fanciest pants. After an evening of mingling with like-minded individuals, day two of IDS focuses on those in the industry with a Professional Trade Day. Enjoy a stroll through the show in style and perhaps stop into the Globe Style event happening Saturday January 21st. If you just can't get enough, sit in on a conversation amongst top design personalities as they predict the latest trends for 2017, presented by House and Home the final day of the show. Here at Luxi, we predict that IDS 2017 is going to be a total blast! Further details regarding admissions, dates, and times of events can be found at http://toronto.interiordesignshow.com. After just completing IIDEX 2016 and as if the list of things "TO DO" wasn't long enough, we've added moving to the top of it! The words "new year, new me" have never been more true as Luxi moves into a new studio this January. Not to mention that we will be sharing our new home with Hana Nelson and her amazing team at Aficionado Fishmongers ... of course because we live in Nova Scotia! We are excited to share with you our involvement with the recent Halifax City Hall Retrofit, through SNMArchitects Limited. Situated in the heart of Halifax, the three story stone structure was erected in the years 1887-90. As a National Canadian Historic site, the building is a marriage of styles from across the eras. Our custom design, now know as Roinn, is a nod to that history, with Art Nouveau combined with a modern contemporary aesthetic. For this project we created eighteen luminares in five different configurations, including sconces and multiport canopies. We would like to thank our photographer Jarrell Whisken of Elemental Photography for capturing our efforts! The countdown is on! IIDEX 2016 is just around the corner, with IDS following closely behind in January 2017! IIDEX - short for Invention, Innovation & Design Exhibition - is Canada's National Design + Architecture Exposition, taking place over two days - November 30th & December 1st. 2016 marks Luxi's second year participating in this annual show. IIDEX focuses on all areas of design including workplace, healthcare, hospitality, retail, residential, education, architecture, sustainability, wellness, accessibility, and most importantly for our studio - lighting! We've got some new and exciting things in the works to bring to this show and its runner up IDS! The Interior Design Show [IDS] hosted in the Canada's beating heart of design, Toronto, Ontario is now in its 19th year! This event is three and a half jam-packed days of concept and design superstars from North America and beyond! Needless to say, we look forward to seeing you soon Toronto! Interior Photograph by Sham Sthankiya. Dura House is a magnificent Terence Bay home, designed by David Coole of DR Coole Architect Inc. 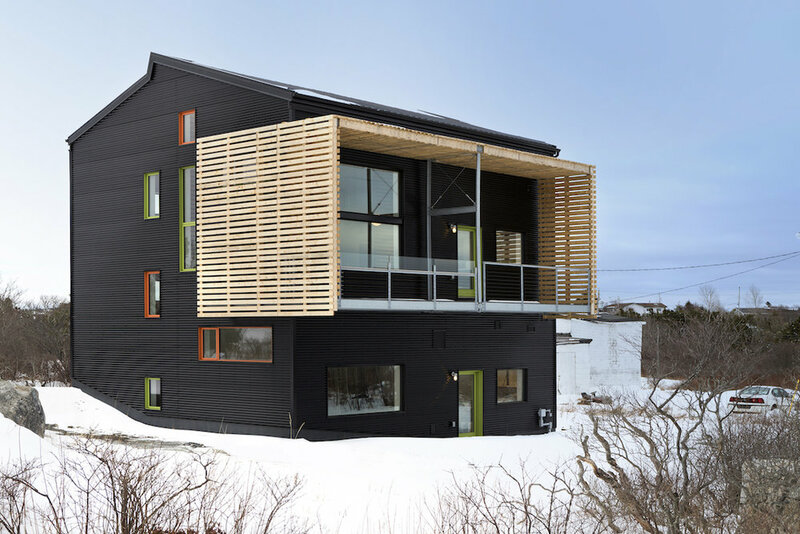 This modern structure is the winner of the 2016 Canadian Green Building Award for the Atlantic region and the recipient of the NSAA 2015 Lieutenant Governors Design Citation. The structure is noted for its respect and sensitivity to the climate of the Northern Atlantic coast. The home was meticulously designed with a sleek and modern aesthetic. Included in its contemporary appeal, Dura house features 5 custom luminares from Luxi Studioworks. These pieces were designed to respect key sight lines and views of the beautiful Nova Scotian coastline. From our studio to yours, Luxi would like to extend many thanks and congratulations to David on a tremendous project. Exterior Photograph by Jarrell Whisken. Welcome to the moment you've been waiting for ... Drum Pendants and Sconces are now making their way into our suite of designs. Scale is such an incredible design element that allows for play and we've been doing lots of playing in the studio lately! Pictured, you see an example of our Lubach Drum Pendant. We'll be back with our encore images of our sconces shortly - hang onto your hats! Dana Grund, owner of Grund Designer Goldsmith has recently relocated to King's Wharf! If you're in the area grabbing a coffee on a sunny Saturday morning, the studio is open to the public from 10:00 to 5:00 and it is well worth the visit! The new space has a very contemporary, modern feeling along with being open and inviting! Designed by Dana himself - Luxi completed a set of 18 custom lights to help compliment the chic atmosphere. Pictured is a sneak peek at the production processes of Luxi Studioworks and a snapshot of some of the fixtures after install. For the full experience, be sure to visit 15 King's Wharf Place, Suite 105, Dartmouth - say hello to Dana for us! The studio has been a very busy place getting ready for the Halifax City Hall retrofit! Luxi will be creating over 80 pendant shades, custom canopies, and introducing a sconce to our suite of designs that will be installed the end of August 2016! We look forward to showing off the completed project - stay tuned for images! Dine by Design East is a delicious display of Atlantic Canada's culinary and design excellence. Funds raised throughout the four day event support design education at NSCAD University through the Amber Harkins Memorial Scholarship Fund. Success of the event has allowed for the awarding of two full scholarships thus far! Luxi's Lomhara pendant was featured this year by Lovely Nova Design, and a collaboration of the two studios resulted in the centre fixture!